The past is the father of the present and future, but as you’re not your father, you can’t stand on his steps forever. A band must always move on, into the future and without looking back from where it came. You can use an old musical genre to breed something new, for it’s not a sin, after all. And the international effort called KISSIN’ BLACK seems to catch this idea, as their latest release, the album “Dresscode: Black”, shows. They’re a band based upon the same old and good Gothic/Dark Rock from the 80’s, sharing the same melodic, accessible and darkened approach, but with a modern outfit and using more musical influences to build their songs. It’s truly dark and even elegantly funereal, but accessible and easy to assimilate. And they really show talent and identity during the entire album. The production is really excellent. To such musical work, a clean sound quality is a demand, not a need. And it’s what “Dresscode: Black” shows, with defined tunes that allows the full understand of what is being played. Of course it’s not so hard to build such work, but the level is really high. The album bears 13 songs that can be easily assimilated by the senses, and the darkened and introspective insight of “Giants” and of “Riders” (both with charming choruses), the Country touch on “Liquor Tears” (one of the most electric song of the album), the Gothic approach shown on “Dresscode: Black” (this one brings to mind that musical Pop touch that THE MISSION and FIELDS OF THE NEPHILIM used to have on the past), the fine pianos arrangements on the tender “Jolie”, the Pop Rock tempos and outfit of “Address Unknown”, and the Gothic melancholic energy that fills “The Visit” can be pointed as songs that will hook the fans by the ears. 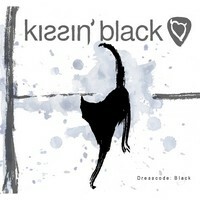 Yes, KISSIN’ BLACK is really a very good band, and “Dresscore: Black” will take them to a higher level or recognition in their musical genre. 1. Chi dice porto sfortuna?